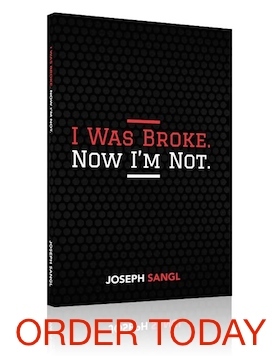 SPECIAL INVITATION: Join Joseph Sangl, founder of I Was Broke. Now I’m Not. for this special LIVE on-line event. As I’ve traveled the United States and Canada teaching hundreds of thousands of people about winning with money, I’ve seen this to be true about many people’s financial situation. The mass of men are indeed living lives of quiet financial desperation! They are desperate for an answer to their financial challenges. They are sick of living paycheck-to-paycheck. They are exhausted from attempting to “just work more” to satisfy their financial needs. They are skeptical of who they can truly trust when it comes to the money they are actually able to save. Let me ask you a question: Are you ready to have the BEST financial year of your life? If your answer is “YES!” you definitely do not want to miss this upcoming special LIVE on-line event! THIS EVENT WILL HELP YOU KEEP YOUR NEW YEAR’S RESOLUTION! I truly believe you can have the best financial year of your life in 2014, and it is for this reason I’m hosting this event. SPACE IS LIMITED FOR EACH OF THESE EVENTS I do need to let you know that space is limited for each of these events. It is available to the first 1,500 people who sign up, and I will be sending this invitation to 33,475 people over the next few days. If you are ready to begin living a fully funded life in 2014, you won’t want to miss this special event.